Lunch is an important social event at the school and, in response to parent’s feedback on school lunches, Fern Hill has provided an in house catering service from September 2015. This has been a great success, improving the quality of the food served to the children and sourcing local reputable suppliers to provide fresh, seasonal produce that can be enjoyed by all. The children also enjoy seasonal taster produce grown and picked from our own gardens. Our lunches comply with the government standards for school meals. They need to be ordered and paid for in advance. For the current menu and information on how to order lunches, click on 'Current Lunch Menu & Information Sheet'. All other children need to be provided with a packed lunch, which should be brought to school in a named lunchbox which can be easily stored. A still drink may be included, though water is available in the lunch hall. Please include a spoon if your child has a yoghurt etc. Please do not send cans or bottles of fizzy drinks, containers which might leak or flasks containing hot drink or food. Please also note that confectionery and nuts are not allowed. In the event of a child forgetting their lunch we do attempt to contact parents. However, if no packed lunch has arrived by 11.30am we will give the child a suitable hot lunch. Parents will be informed by phone or email, and KS2 parents will be charged for the meal at the normal rate, if applicable. 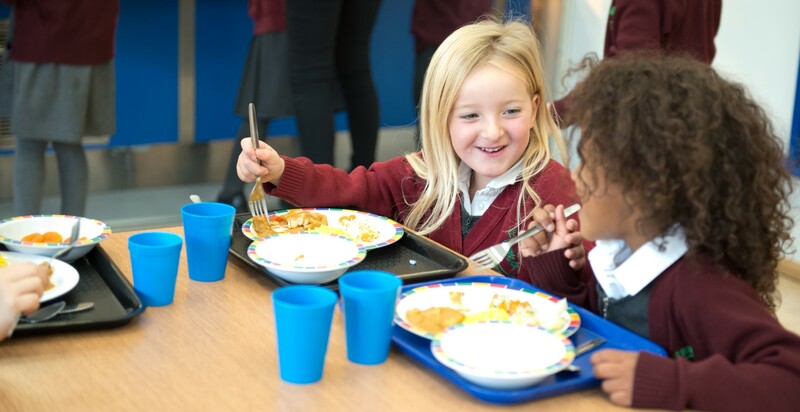 All children in Reception, Year 1 and Year 2 are entitled to a free school meal as part of the Universal Free School Meal scheme which began in September 2014. Please note that although lunches are free of charge for these children, you must still place an order for a lunch and make a selection from the menu. If your child has any allergies or dietary conditions please ask at the school office for a Special Dietary Information Form.